UFO SIGHTINGS DAILY: The Hololens, A Monumental Tool For UFOlogist, Feb 29, 2016, UFO Sighting News. The Hololens, A Monumental Tool For UFOlogist, Feb 29, 2016, UFO Sighting News. 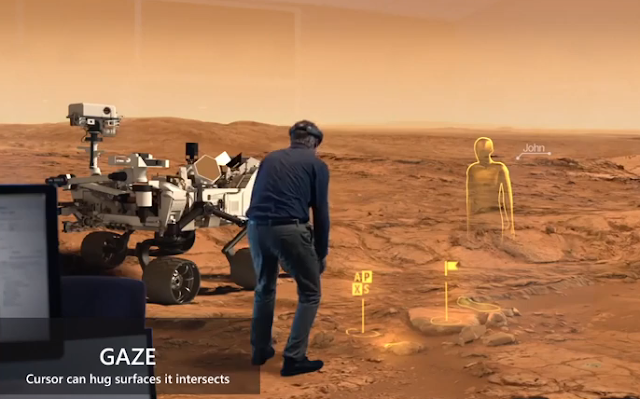 Holographic glasses will one day become the number one tool of alien artefact hunters that search through government Mars and space photos for archaeological structures. This new tool will give you a 360 degree view of many objects and allow you to actually stand over some of them. It will need about 5-10 more years to have enough apps for it, and for the headset to be smaller and lighter than it is today. It will change the world we live in forever. How...is up to us. Gaze is one form of input on HoloLens. It tells you where the user is looking in the world and helps you determine their intent. This video provides an overview of Gaze input and the concepts you need to learn to work with this form of input.